With any concrete surface, it’s important to first remove old paint and coatings as part of preparing concrete for paint, racking and more. Before you can you can apply any type of coating to your concrete floors, surface preparation is key and can affect the final look and quality of your concrete surfaces. Even if you are painting the concrete floor it is imperative that the surface be profiled and cleaned to ensure proper adhesion. 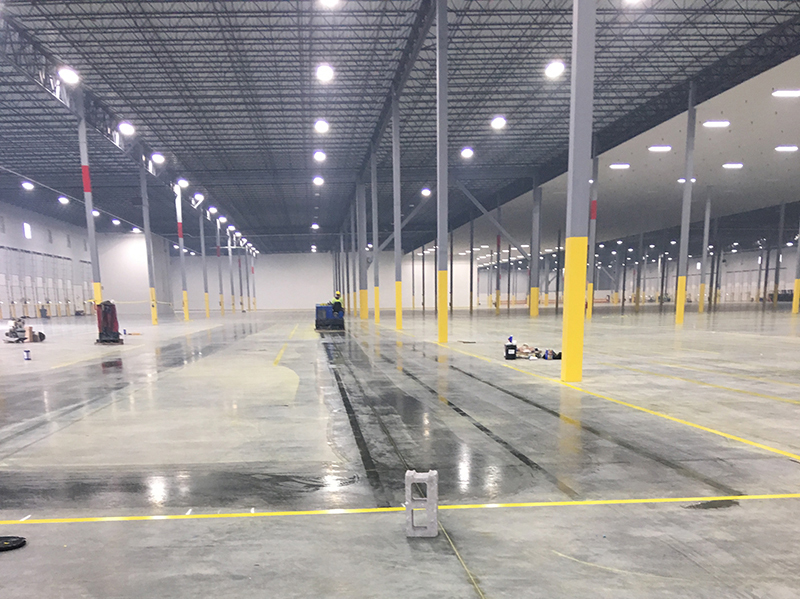 Whether you are preparing to move operations or reconfigure your existing processes, ProMark Contracting is an experienced concrete floor grinding contractor that can help prepare your concrete floors for paint and epoxy coatings. Different types of paint come up differently. There is an array of methods to removing paint from the floor, but it’s important that it’s done with minimal surface damage. There are a number of paint stripper methods for concrete surfaces and floors, but the best ways for old coatings are diamond grinding, scarifying, and shot blasting. All of these methods are used in different steps to remove painted lines so there is the least amount of disruption to the surface of the concrete floor. In diamond grinding, there are dozens of different diamond heads and diamond pads that will leave a smooth finish or be more aggressive, depending on the condition of the floor and the age of the paint or coatings. Scarifying concrete floors is the oldest way of preparing concrete for paint. In this process, a concrete scarifying machine is used to cut into the surface of the floor, creating lines, or grooves, in the surface. When used in conjunction with other concrete paint stripping methods, scarifying concrete floors can be ideal for removing coatings, even those with heavy floor tile mastics, rubbery elastomeric, or epoxy materials. Scarifying concrete floors is also a great way to groove walkways and other areas to make them slip resistant and for leveling uneven surfaces or misaligned concrete joints. Shot blasting is a process in which a wheel of paddle-type blades propels steel shots at a high velocity toward the concrete surface, fracturing and removing the surface of the floor. While shot blasting is ideal for preparing concrete for paint, self-leveling or polymer overlays, and epoxy toppings and most coatings, they are not effective for removing rubber or heavy elastomeric coatings, because the steel shots will bounce off the surface. 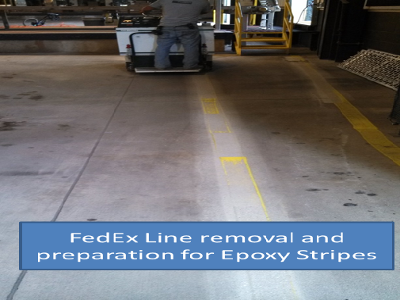 Do you need to have painted lines removed in your facility without etching the concrete? We have a proven system to remove painted lines on concrete without etching or damaging the concrete surface. Unlike other concrete floor grinding contractors, we don’t offer just one solution for all concrete paint stripping jobs. 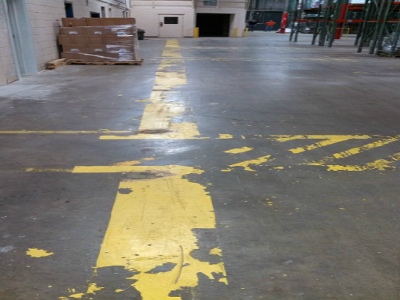 At ProMark Contracting, we understand that every situation is different, which is why we evaluate your facility and its floor markings to determine the best solution for you. 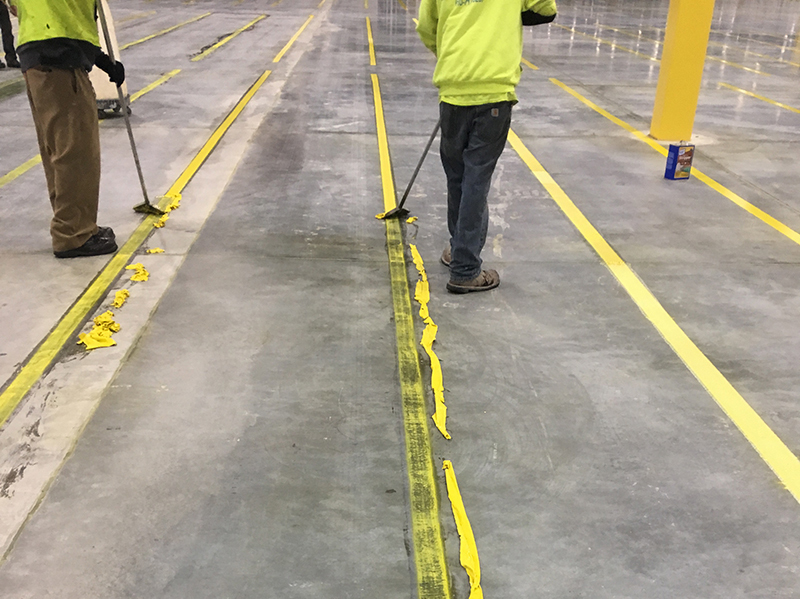 Our vast experience of working with a variety of paint removal techniques ranging from paint strippers for concrete to scarifying concrete floors, allows us to create a custom solution to fit your facility’s needs. Depending on how many layers of paint, sealers, and coatings are present, we will determine what the best option will be to start with. When removing multiple layers of paint, we often use a combination of methods to ensure the best results. By using a combination of paint removers, scraping, and burnishing/polishing pads, we can remove the paint without scarring the surface. Many other concrete floor grinding contractors are versed in only one method of paint removal, with many only offering diamond grinding services. What these companies don’t understand is that before even getting to that finish, the painted lines may need to have been scarified and shot blasted. 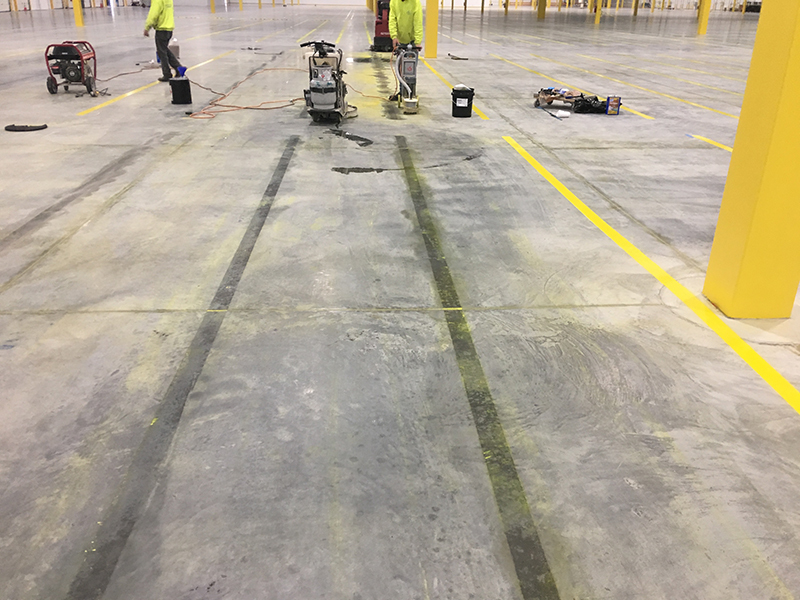 At ProMark Contracting, we can not only offer effective paint stripping for concrete, but we can help in preparing concrete for paint as well. After the removal process, it often is not a bad idea to have the cement floor sealed only where the removal areas were. This will protect that area as it was before the paint was installed. Our crews can mobilize to prepare your surface for your next overlay coating project. There are several methods available depending on what material you are applying and what profile is needed on the existing surface. Whether your lease is up or you need your markings removed for any reason look no further than ProMark Contracting. 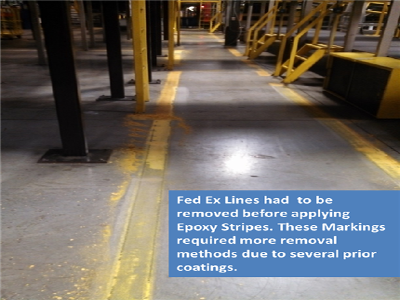 We have the capabilities to remove several thousand feet of markings per day. Contact us today so we can help find the best method for your removal project.